A Medieval to Post-Medieval copper alloy dagger pommel and quillion probably dating from AD 1450 - 1600. The pommel has a convex circular top divided by deep V-sectioned radiating grooves into a sexfoil. The reverse of the pommel is also convex, but has a large central aperture. There is a sub-rectangular hole for the tang in the centre of the upper face. The pommel has a thin dark green patina. It is 30mm in diameter, 15mm in height and weighs 34.7g. The remains of gilding can be seen on the top of the object. 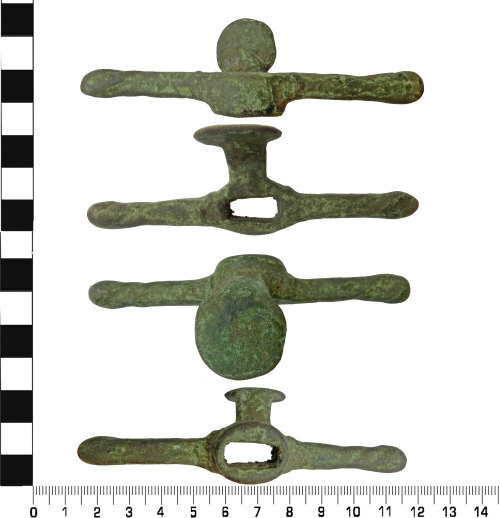 Matching examples of this sword pommel have been recorded on the PAS database. Compare LEIC-158DA1, NMS-31EB60, NMS-0C90A0 and NMS-2482D4. They have all been attributed to the late 15th or 16th century. However, also see LANCUM-9BBEE0 and LVPL-5427A6 which have had a broad Medieval date suggested. Though there are no exact parallels, the general style of swords and daggers in Holmes (ed) (2006) Weapons; A Visual History of Arms and Armour suggests that the later date is more likely for this example. The dagger quillion is from a single-bladed dagger, probably dating to the 15th - 16th century. The object's central section is rectangular in plan with an elongated trapezoidal hole to receive the tang of the dagger. The arms are circular in cross-section with a decorative twist at each end. The object measures 89mm in width, 28mm in height and weighs 46.9g. A similar quillon guard may be found in the Medieval Catalogue (Ward-Perkins, J.B. 1940 London Museum: Medieval Catalogue London), page 39, plate VI, number 1 dating to the 15th to 16thcenturies.